Save more lives in CCU with CPAP : Should be used liberally in LVF to prevent the onset of cardiogenic shock ! Coronary care units are the place, where acute myocardial infarction patients are housed. Thrombolysis is still the primary modality of treatment world over .Large infarcts, , impending or established cardiogenic shock are major source for mortality . Acute left ventricular failure (LVF ) in CCU has to be swiftly managed in whatever phase of MI .Standard regimen of sedation, diuretics, Nitro glycerine, and Dobutamine are administered are often not good enough . ( Its true many of these patients are to be taken for emergency PCI ) Still, medical management of LVF has a huge impact on the outcome. While cath lab procedures are given top priority , I have seen many times, simple concepts in CCU not getting proper attention.Continuous positive airway pressure(CPAPA/Bilevel-NPPV) aided oxygen administration has a critical role to play in this setting. Why not Intubate these patients ? It’s true Intubation and ventilation may be required ultimately in many of these patients. .It has its own issues of prolonging the stay and infection . Even though the clinical trials do not show consistent impact on long term survival , we have time and again found this modality useful .Timely administration of of CPAP definitely halts the progression of mild forms of LVF to full fledged cardiogenic shock and leads to recovery in many . CPAP/Bilevel-NPPV is important hemodynamic stabilising tool , that should be used liberally whenever possible . There has been number of studies exploring the role of CPAP in acute LVF during STEMI. 1. Treatment of severe cardiogenic pulmonary edema with continuous positive airway pressure delivered by face mask. Bersten AD, Holt AW, Vedig AE, et al N Engl J Med1991;325:1825–30. Pulmonary vein isolation in AF : Seems, it’s Just not adequate ! A land mark concept , that changed our understanding about the mechansim of genesis of Atrial fibrillation happened in the year 1998 . ( Haïssaguerre ,Spontaneous Initiation of Atrial Fibrillation by Ectopic Beats Originating in the Pulmonary Veins N Engl J Med 1998; 339:659-666). He proved AF originates in specific focal points from the pulmonary vein ostia at its draining point in LA.Even though there only few selected focal points it was difficult identify those and hence empirical RF ablation of all 4 pulmonary vein became a standard practice. 100s of thousand of these invasive procedure were carried out in patients with chronic AF. Now, in a span of 10 years , we realise many of these patients require second or third siting of ablation.The irony is , there are many non pulmonary connections that require repeat ablation. Multiple mechanisms /*Non- focal , systemi AF mediated by neurohumoral triggers ? 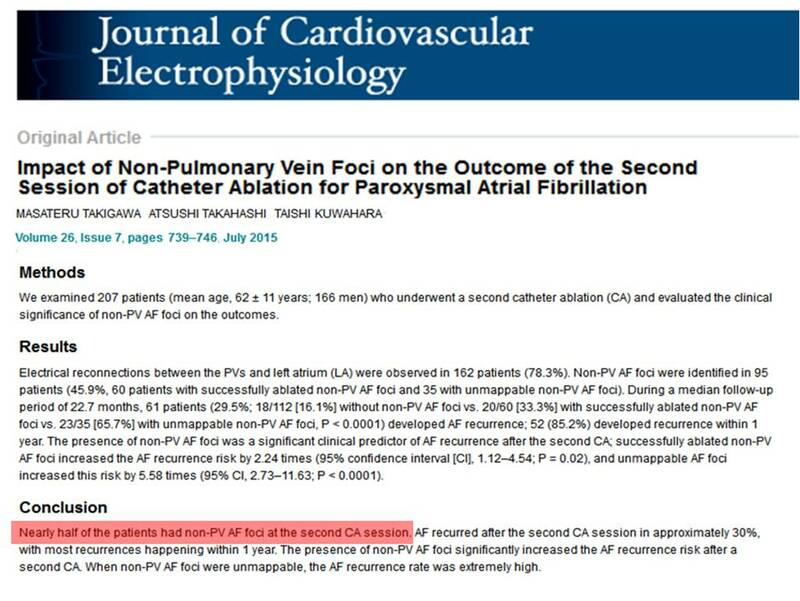 A study from the prestigious JCE in May issue of 2015, reveals a starling fact , that about 50% of AF patients have additional connections other than pulmonary vein that require ablations at a future date. If proven right , just wonder how much of knowledge and its dissemination , efforts from EP industry , technology transfer over the years is threatening to become redundant .Let us hope,we will somehow conquer the AF either electrically or pharmacologically. A strong message comes out from this. In modern science, one need not be unduly excited about a new breakthrough.Proof of concept will have to overcome the ultimate test , ie time . Why the concept of “Primary prevention” of CAD is Intrinsically flawed ? We essentially live in our blood vessels and age in our arteries.CAD is the principal cardio vascular disease, which God has created in Homo-sapiens to ensure they do not stay more than “allotted life span” in this planet. Of course , the current generation cardiologists equipped with scientific weapons , have since decided to take the fight directly in the Almighty’s domain .Contrary to the popular medical doctrine, treating an established CAD seems to be easier task than preventing a new onset CAD. While , arteriosclerosis is a normal aging process, atherosclerosis could be an aging as well as a distinctive pathological process. However , athero-thrombosis is a definite pathology of vessel wall .We know at any time atherosclerosis can transform into athero-thrombosis and result in clinical event depending upon the triggers and other associated conditions, which we refer to as major or minor risk factors. For all practical purposes CAD and coronary atherosclerosis is synonymous. Can we prevent atherosclerosis in human biological system ? What are we supposed to refer to such a preventive measure , if any ? Preventing sub-clinical CAD from manifesting as clinical CAD , is technically primary prevention” but still patho-biologically secondary prevention. Preventing a CAD in a patient with peripheral vascular disease or preventing CAD in a patient with TIA or stroke is secondary prevention for cerebrovascular disease but falls within the definition of primary prevention of CAD. So ,whenever , we talk about primary prevention of CAD by Aspirin or Statins ,realize the complexities involved .Before i finish, let me make you dizzy further with this quixotic one . In a multivessel CAD, as the atherosclerotic plaques are scattered across the coronary arteries in various stages of maturity , long term Aspirin following anterior STEMI has to secondary prevent an event in LAD territory . . . but primary prevent a plaque disruption in RCA territory ! What is the Impact of Aortic annular dilatation on TAVR ? Does it carry a risk of dislodgement ? backed up by major trials What keeps the Aortic prosthesis in situ in the aortic root/Annulus ? The valve is not actively fixed but passively positioned in aortic root by either self expanding or balloon expanded valve system .It retains the position by two different forces acting on the valve in two difffernt directions , but work coherently to keep the valve static .The radial force of the hardware is centrifugal and the elastic force exerted by annulus is centripetal .It may appear mysterious how these oppose each other in a balanced way and arrest the valve in the desired site. Fortunately, there is little supero- inferior force operating and hence the chances of dislodgement is low .It should also be mentioned we are not yet clear about the best site for TAVR. Annular , supra annular ,or is it at lower virtual annulus , all has some advantages and disadvantages. Is progressive aortic annular dilatation possible in these degenerative aortic valve ? Aortic stenosis is chronic degenerative disease. Generally we expect the annulus is narrow and fixed. However for some reason if the aortic annulus loses it constricting force or the root dilates or fresh calcium deposits, there is definite risk (Not theoretical :See Reference ) of valve destabilisation , dislodgement and embolisation . *It is vital to understand the para-valvular leak could be a remote precursor of such potential dislodgement as it represents micro gaps in the prosthetic / tissue interface. How many such embolisation of valves are reported following TAVR ? While the incidence of para valvular leak is common ,(up to 20%) fortunately valve embolisation is reported between .3 to 7.5% (Ref 2). Stastically , subclinical destabilisation, malpostion and dislodgement should be more common. The timing of displacement is not clearly reported in literature .It can occur at any time between few hours after implantation to a much delayed (months after ) complication . TAVR is a major break through in Interventional cardiology .It gives us hope for possible TAMR (mitral) and other valve repair modalities .Though dislodgement of prosthesis appear a rare event it is tempting to ask , whether we should work towards a actively fixing valve in aortic root ? That remains a open question ! 1. A survivor of late prosthesis migration and rotation following percutaneous transcatheter aortic valve implantation. Pang PY, Chiam PT, Chua YL, et alEur J Cardiothorac Surg 2012;41:1195-6. 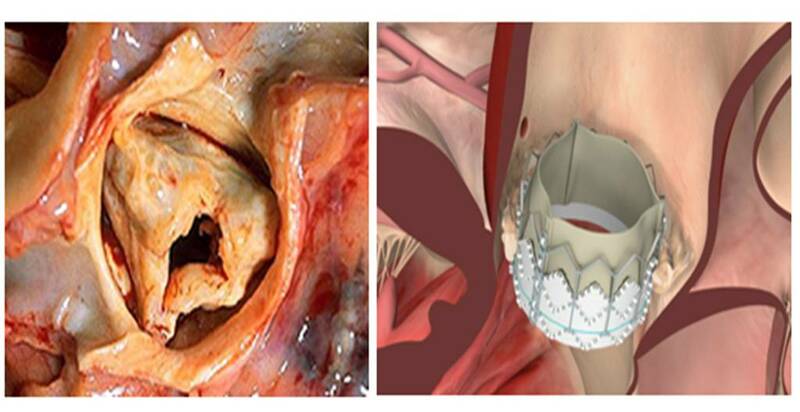 2.Thirty-day results of the SAPIEN aortic Bioprosthesis European Outcome (SOURCE) Registry: A European registry of transcatheter aortic valve implantation using the Edwards SAPIEN valve.Thomas M, Schymik G, Walther T, et al. Circulation 2010;122:62-9. 3.Migration of the transcatheter valve into the left ventricle Christopher Cao , Su C. Ang , Michael P. Vallely Mart Annals of Cardiothoracic Surgery Vol 1, No 2 (July 2012 4.Delayed Transcatheter Heart Valve Migration and Failure Vuyisile T. Nkomo, Rakesh M. Suri, ,J Am Coll Cardiol Img. 2014;7(9):960-962. What does a PDA do in dTGV ? . . . Helps correct hypoxia or worsen the failure ? Presence of VSD provides vital time interval to plan surgery in a less emergent fashion. Otherwise , arterial switch if contemplated one has to do it before 2-3 weeks (Rarely up to a month ) .The principle is to reverse the circulation before the systemic left ventricle regress its myocyte function as it is exposed to low pressure pulmonary circuit . We know , dTGA has two parallel circuits in a bizzare hemodynamic disconnect .The right sided pulmonary circuit sustains the systemic blood flow with deoxygenated blood.The left sided systemic circuit recirculates oxygenated blood into pulmonary circulation again and again. Survival depends upon , the anatomical communication between two circuits and the effective quantum (Deoxygenated) of blood flow to the lungs . Which communication is best for survival d TGA ? It appears both atrial ventricular level mixing is good for maintaining adequate O2 saturation than PDA . What does PDA do ? Ductus can be a double edged friend or single edged foe in dTGV . It depends upon the size , quantum of shunt and associated channels of mixing like ASD and VSD . If it occurs with intact IAS and IVS it plays a role of life sustainer. Presence of ductus is definitely useful initially.It can either help by mixing, intermittent bi-drectional shunting or committed left to right shunting .This is why we attempt to preserve its patency or even recannalise it by stenting in such situations .The later can be used to buy time and train the regressing LV .However ,large ductus can be counter productive if additional shunts are also present where one should even contemplate closing it . 2.Transposition of the great arteries with intact ventricular septum and patent ductus arteriosus. Waldman JD, Paul MH, Newfeld EA, Muster AJ, Idriss FS.Am J Cardiol. 1977 Feb;39(2):232-8. 3.Ductal recanalization and stenting for late presenters with TGA intact ventricular septum Shyam S Kothari, Sivasubramanian Ramakrishnan, Nagendra Boopathy.Ann Pediatr Cardiol. 2011 Jul-Dec; 4(2): 135–138.